Classic overstuffed plush comfort gets a contemporary upgrade in the Logan Velvet Sofa, a velvety cloud available in a vibrant variety of hues. 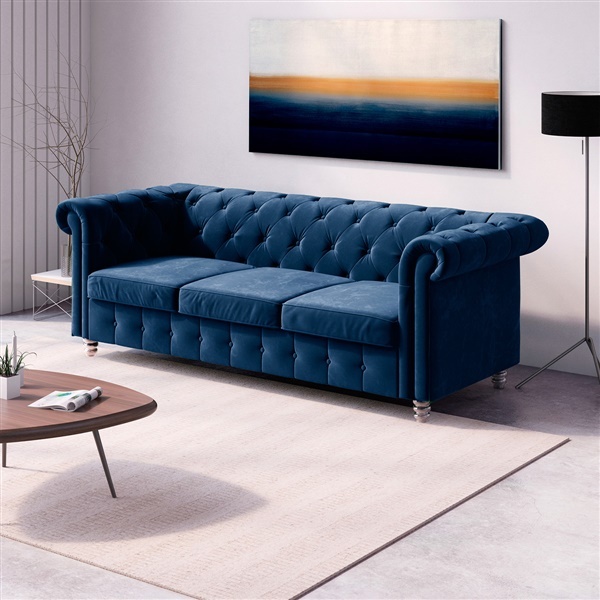 A modern version of old-world glamour, the Logan Velvet Sofa features meticulous button-tufting details for visual and tactile appeal, along with a memory foam interior and a hint of icy-cool glimmer in its unique acrylic legs. Both exciting and inviting, and ideal for aesthetics both understated and eclectic, the Logan Sofa makes a sophisticated statement with just the right whimsical touch. Expertly upholstered in rich and luxurious velvet. Your choice of bold, vibrant hues. Added memory foam layer provides extra comfort. Unique clear acrylic legs are sturdy and elegant. Clever combination of classic comfort and contemporary character. This sofa was a bold move in my house and I am thrilled to say it was the best decision i could have made in terms of style! Finally shaping up the place to be what I want! an excellent choice if I do say so myself! AWESOME COLOR, LUXURIOUS SHAPE, CHARMING IN MY NEW APARTMENT!! Smooth and soft to the touch!! Adore that classic armrest design! The velvet is luxurious and the clear acrylic legs are spectacular. It is also very firm. But the sofa was almost impossible to assemble. It took four of us to get it together. And it took over 9 weeks for delivery. That's because the first sofa that I received was defective, so I had to work with customer service to get a replacement. An infuriating process, but one that was resolved to my satisfaction in the end. ProsBeautiful fabric, great style, and the clear feet are fabulous. Cons Lacking in quality control, very difficult to assemble, and the sofa is quite a bit firmer than I expected. My kids are in college now so I finally made the decision to redecorate the family room. Ordering furniture online without seeing it in person is hard, but when I came across this sofa, I knew I was making the purchase. The clear legs combined with the curved arms and the tufting, it all comes together to create this magical piece. I could not be happier with it. I did order a few other pieces from Inmod along with this sofa and everything went smoothly. Loving all of my new goodies! This sofa is so elegant looking in general but I ordered it in the charcoal color and it is the perfect it for my room. I have always been a fan of neutrals but this addition really pulled it together. The weight limit of the Logan Velvet Sofa is 700 lbs.